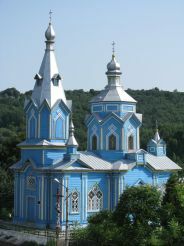 In summer 1675, the Virgin appeared in the sky above Pochaivs’ka Lavra in order to defend the temple against Tatars’ siege; that was a period of Zbarazhs’ka War. Enochs and Laymen prayed the miracle-working icon of Mother of God and it helped them. Lots of prisoners came to believe and converted to Christianity after this battle. The year of 1559 proceeded these events, when Neofit, the metropolitan gave Anna Hais’ka, Orthodox landowner the icon of the Mother of God; she gave it, in its turn, as a gift to Lavra collection. 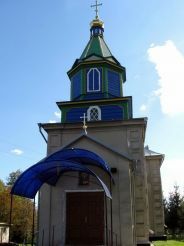 Since that, the miracle-working icon is in Sviato-Uspens’ka Pochaivs’ka Lavra in Pochaiv village of Ternopil region, healing thousands of sufferers up to the present days. The icon of the Mother of God is famous throughout Orthodox world, but this is not the only reason to visit Pochaiv. There is a legend, a cloister was founded by monks of Kyivo-Pechers’ka Lavra in 1240, however, the other sources affirm its existence long time ago. Anna Hais’ka, the landowner was interested in reading a shrine and composed a donation to improve Orthodox Cloister of Pochaiv where St. Job Pochaivs’kyi was considered to be an organizer and first idea proposer. His relics are saved in a cave temple – a place of admiration and grace. The same place guards the relics of Venerable Amfilokhii Pochaivs’kyi, who had a power of second sight and cure to present it to serve the God and help people; up to date his grave can see genuine healings. Pochaivs’ka Lavra new lot of misfortunes, conquests and anxious times, including Brest union, which converted the cloister into Uniat Church despite long-time resistance. These happenings favored the appearance of architectural peculiarities. So that, Uspes’kyi Cathedral was erected to have Catholic elements (2 towers on-the-mitre to the principle axix decorate a facade of the construction), on the whole, the composition is built in Cossacks baroque. 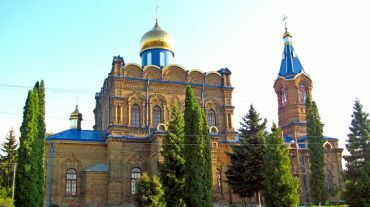 The cathedral is located in the centre of the monastic complex, so that, its gold domes tower in sunbeams, above snow-white erections to stand close to it. After Volyn’ joined the Russian Empire, a dwelling palace was returned in bosom of Orthodox Church. In 1833, the cloister achieved a status of Lavra. A great number of buildings with adornments were constructed in that period, including a new belfry, fraternal cemetery; a gallery of Uspens’kyi Cathedral was reconstructed and now it charms its beauty. According to traditions, the godly Anna and Joachim had no children for a long times, and only due to prayers and deep faith, the God sent Havriil, the archangel with good news that they will give birth to the blessed Mother of God. On the place of the icon of St. Anna laymen constructed a chapel, at the same place, a fountain played with a strong power to be remained up to these days as it cures and give a certain power. People call the St. godly Anna’s source to be Lake of St. Anna. Thousands of people visit this place to heal mental and physical wounds, to pray in shrine and drink saint water. 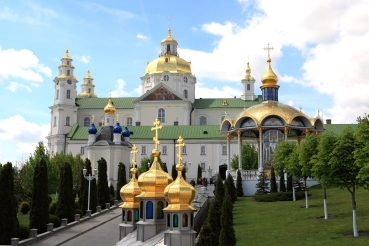 Sviato-Uspens’ka Pochaivs’ka Lavra - is the biggest Orthodox Shrine at the territory of Ukraine to see annually thousands of pilgrims all over the world. One will be impressed not only by elegant architectural constructions of the cloister, but also by a great number of miracles, to happen at its territory. In the course of many centuries thousands of people came to believe and became aware of the blessed gifts of Pochaivs’ka Lavra. This is a place to answer many questions of yours and to find out physical equilibrium.